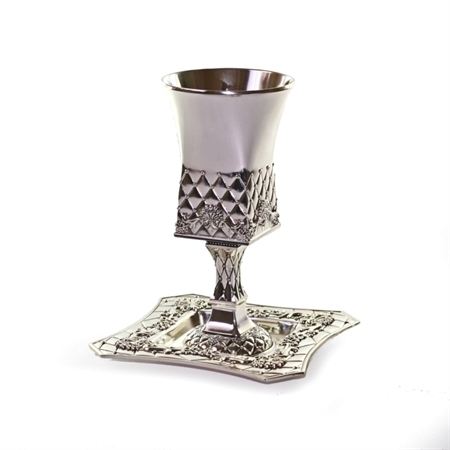 Smooth polished finish rises from the pillowed triangular lattice design that starts at the base of this square bottom Kiddush goblet and continues on the matching saucer. A raised vine goes around both the goblets cup, the foot of its stem and the saucer. Available in silver plate or pewter finishes. What could be a better gift for a young Chattan as a wedding present, than a matching set of Kiddush goblet and saucer for him to use every Shabbat and Jewish holiday meal? The square bottom fits neatly on top of a square footed stem, which allows the goblet to be easily held when making the ritual blessing over wine or grapejuice. 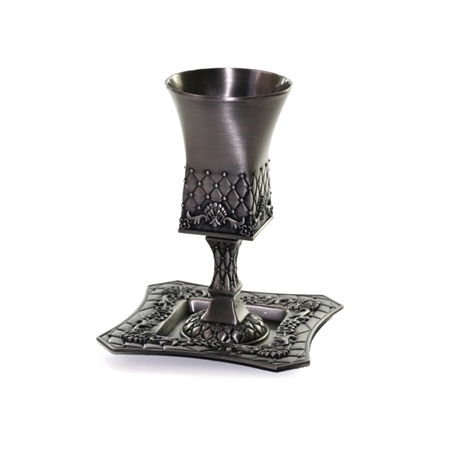 A triangular honeycombed lattice design seems to be decorated with a draped vine design as it goes around the four sides of the Kiddush cup part of the goblet. The saucer's four sides gently curve inward and the four corners are clipped which adds to the overall design. The raised vine leaves over the lattice work on the saucer compliment perfectly those on the kiddush goblet.